Metal shingles allow now allow homeowners to have the benefits of metal roofing, with the traditional shingle look. Our low maintenance metal shingles come in a variety of different styles including shingle, villa tile, and even shake. These high tech roofing shingles provide economical and environmental advantages that shingles do not. 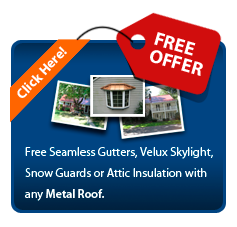 Metal shingles will help maintain the temperature of your home, saving you money and reducing your energy costs. Metal shingles are elegant and long-lasting, providing a great alternative to asphalt shingles. These metal shingles won’t crack, curl, split, rot or blow off; giving you piece of mind about the integrity and beauty of your roof. These metal shingles are great option for reroofing your current home, or your new construction project. A standing seam metal roof can lower your energy costs by up to 40% A shingle roof heats up all day and transfers heat into your home.